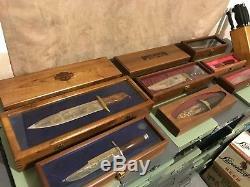 One of a kind set including 9 large blade limited edition vintage knives. 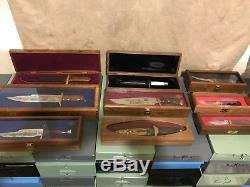 (8 Buck and 1 Gerber), and much more. 3 different prototype Harley-Davidson multi-tools with sheaths I believe only two of these were ever produced but these are all prototypes. I believe these are all the first samples sent to Harley-Davidson for approval. 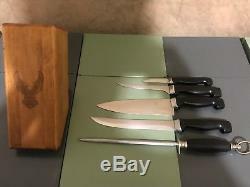 Prototype Kitchen Knife set Was produced for a very limited time. This, I believe, is the first one produced for Harley-Davidson for approval. My father was a 40 year Harley-Davidson employee and later executive for the company. 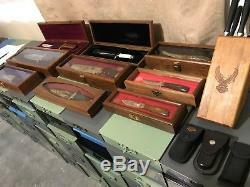 He obtained these prototypes while working with various knife makers when he was a category manager for HD. We actually used these knives in our kitchen for some time to sample the knives. We however did not use the block in the kitchen and it is in perfect condition. The kitchen knives are used quite a bit as that was the purpose of bringing them home. 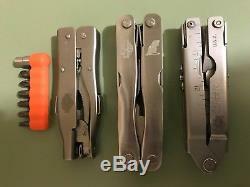 I also used the Gerber Multi-tool for a bit as a teenager for the same purpose. 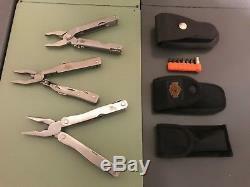 Other two multi-tools are brand new and never used. Most of these knives were from the 1990's. Here is a complete list of what's included. 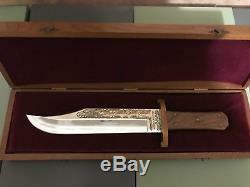 85th Anniversary Bowie (Buck 2666/3000) Glass in wood box is cracked---but easily replaced, just a loose panel. It was received this way when new. Black Hills Bowie (Buck 2206/3000). Superglide 20th anniversary Bowie (Buck 2143/3000). Knucklehead 50th anniversary Bone handled Dagger (Buck 1644/3000). Knucklehead small Dagger (Buck 2399/3000). 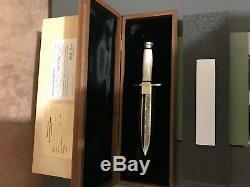 Flathead small Dagger (Buck 2971/3000). Live to Ride Bowie (Buck Kalinga 2971/3000). 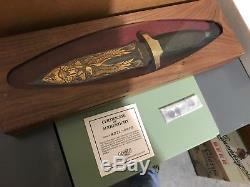 90th anniversary Dagger (Gerber 2971/3000). 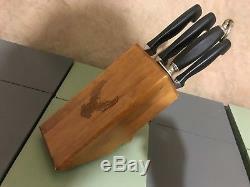 Prototype Kitchen Knife set and beautiful engraved knife block. Prototype Multi-tool (Gerber with Leather sheath). Prototype Multi-tool (Buck Bucktool 360 with bits and nylon sheath). Prototype Multi-tool (Sutter's Mills Specialties with sheath---Unproduced). Prototype V-twin nutcracker (Gaslock) Unproduced. All Certificate of Authenticity included except those that did not originally come with them. All wood boxes are in perfect condition except glass on 85th bowie is cracked (easily replaced 1/8 thick removable panel). 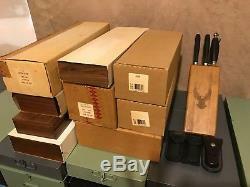 All large knives are unused and in perfect condition. Some knives have slight patina on brass. I doubt you will ever find another Harley-Davidson set anything like this. This is one of my father's most prized HD collections and I hate to let them go but I want these to go to someone who collects HD and/or Buck/Gerber Knives. They are wasted in my possession.. 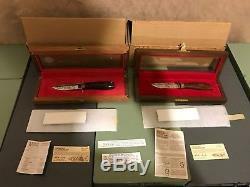 The item "Vintage Harley-Davidson Collector's Knife lot Buck Gerber Rare one of a kind set" is in sale since Sunday, August 26, 2018. This item is in the category "Collectibles\Knives, Swords & Blades\Collectible Fixed Blade Knives\Modern Fixed Blade\Custom & Handmade". The seller is "gutenheimer" and is located in Grantville, Georgia. This item can be shipped worldwide.